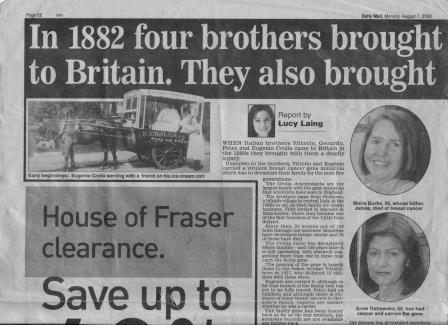 One of the reasons why many people started doing the family research was because of this 2000 article in the Daily Mail*. It seems there is a breast cancer gene in the family which has resulted in the loss of many members, male and female. If you're a direct descendant it's obviously a good idea to get checked out. Gareth Evans of the Genetics Department at St Mary's Hospital is now on 0161 276 6206, ask for his secretary Maggie. We were told that you need a referral from your GP and then on to your local hospital. Better safe than sorry. In 1882 four brothers brought their ice cream making skills to Britain. They also brought a catastrophic cancer gene. WHEN Italian brothers Vittorio, Gerardo, Petro and Eugenio Crolla came to Britain in the 1880s they brought with them a deadly legacy. Unknown to the brothers, Vittorio and Eugenio carried a virulent breast cancer gene mutation which was to devastate their family for the next five generations. The Crolla descendants are the largest family with the gene mutation that scientists have seen in England. The brothers came from Picinisco, a hillside village in central Italy, in the 1880s to set up their family ice cream business. They settled in Ancoats in Manchester, where they became one of the first founders of the Little Italy district. Since then, 25 women out of 120 born through the brothers’ bloodline have developed breast cancer and 18 of these have died. The Crolla curse has devastated whole families and 100 years later it is still spreading, with research suggesting more than one in three may carry the faulty gene. The passing of the gene is largely down to the eldest brother Vittorio, born in 1857, who fathered 15 children with three wives. Eugenio also carried it, although so far that branch of the family tree has yet to be fully traced. Petro had no children and although there is evidence of some breast cancers in Gerardo’s family, experts are unsure whether he was a carrier. The faulty gene has been traced back as far as the four brothers, but accurate records are not available any further back. 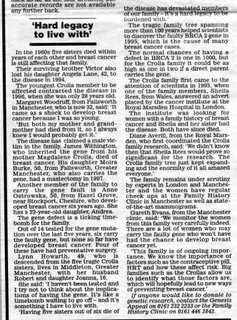 In the 1960s five sisters died within years of each other and breast cancer is still affecting that family. The tragic family tree spanning more than 100 years helped scientists to discover the faulty BRCA 2 gene in 1995, which is the cause of many breast cancer cases. The normal chances of having a defect in BRCA 2 is one in 1000, but for the Crolla family it could be as high as one in two if a direct parent carries the gene. The Crolla family first came to the attention of scientists in 1993, when one of the family members, -----, from Wales, answered an advert placed by the cancer institute at the Royal Marsden Hospital in London. The institute was looking for women with a family history of breast cancer and both she and her sister had the disease. Both have since died. Diane Averill, from the Royal Marsden, who first coordinated the Crolla family research, said: ‘We didn’t know then that Sheila Rees would prove so significant for the research. The Crolla family tree just kept expanding and the enormity of it all amazed everyone.’ The family remains under scrutiny by experts in London and Manchester and the women have regular check ups at the Family History Clinic in Manchester as well as state- of-the-art mammograms. Gareth Evans, from the Manchester clinic, said: ‘We monitor the women from this family very carefully indeed. There are a lot of women who may carry the faulty gene who won’t have had the chance to develop breast cancer yet. ‘This family is of ongoing importance. We know the importance of factors such as the contraceptive pill, HRT and how these affect risk. Big families such as the Crollas allow us to identify what those factors are, which will hopefully lead to new ways of preventing breast cancer.’ If anyone would like to donate to genetic research, contact the Genesis Appeal on 0161 232 2233 or the Family History Clinic on 0161 446 3843. 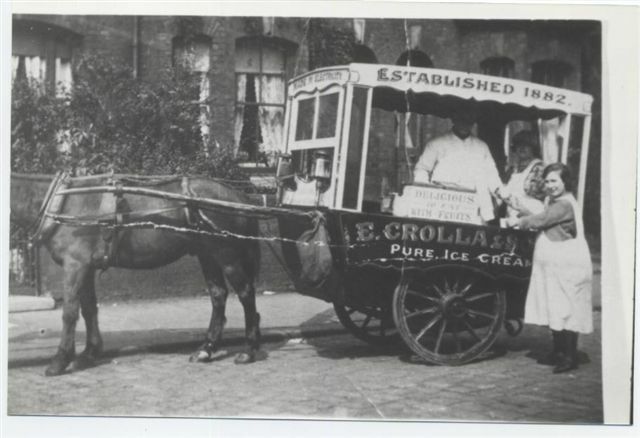 The people in the main picture with the ice cream cart is my GG Grandfather Eugenio and his daughter Felice. She was known as Auntie Fhilly and was even at my parents wedding in 1967. I remember reading this article at work recognising this picture as i remembered this picure from a child. I think we've spoke a few times on GR. I will try with html but if that doesn't work is there any way I can upload the picture on this blog? Hi Vicky, We took a good look at the picture again and it has been confirmed the photo is not of Eugenia Panetta so must be Eugenio Crolla's daughter Felice like you said. I have new information about the Crolla family too. The tree in the Daily Mail Article is full of errors.I sent for the 1899 marriage certificate of my g-grandmother Anunziata Colletta[aka Nancy]&Michael Angelo Crolla[aka Angelo].They were neighbours living at 108&110 Gt Ancoats Street. Michael Angelo was infact the son of Michael Crolla & not Victor as the article stated.I checked the address on the 1891 census & what I assume was MichaelAngelo's father was listed there as Michael Crolla (63) boarder, Italian Organ Grinder, married to Dominica (37) & they had 2 daughters Rose(10)Italy & Mary(3)England. This meant they came to England after 1881. I've got the feeling Michael was Antonio Cesario Crolla's brother Michele ArcAngelo Crolla. Victor&Florinda were on M.A's son Silvester Crolla's wedding photo to Aurelia Fasoli in 1917 so there must be a direct connection somewhere. If anybody has any information that could fill in the blanks could you please post, thankyou Santina Crolla.